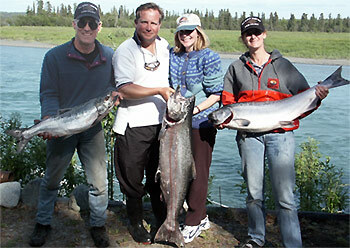 Fish for salmon in the Kenai River or Kasilof River with a respectable river fishing guide. Depending on the day you plan to river fish, will depend on which type of salmon you will be fishing for. Fishing gear is provided. You will need to have transportation to get to the river. After your trip, the captain will fillet your fish for you. Commercial vacuum sealing and freezing are available back at our campground for $1 per bag, as well as ice for $2 per bag. And there are businesses in Ninilchik which offer UPS and FEDEX shipping for your fish. Deep Creek View Campground: Make reservations at our campground in Ninilchik! We offer electrical sites for motorhomes and RVs, tent sites for “outdoors enthusiasts,” and cabins. Visit our camping page for more information. Local bed & breakfasts and cabins: Both Soldotna, 35 miles to the north, and Homer, 35 miles to the south, offer several choices for lodging. Check out the Anchorage Convention & Visitor’s Bureau website at www.anchorage.net for more information.